Bloom(s) of the Week, April 12th-May 3rd, 2015. It is amazing how fast Spring flowers can cause our memories of the snowy winter to fade away. We have been very busy the past few weeks getting the season started off. There certainly is a lot of cleaning up and prep work to do out in the garden. Perennials are coming back fast and furious and many trees and shrubs are already starting to leaf out. Because of the many plants in bloom right now we decided to share some classic sights of Spring, rather than pick one particular species for our bloom of the week. 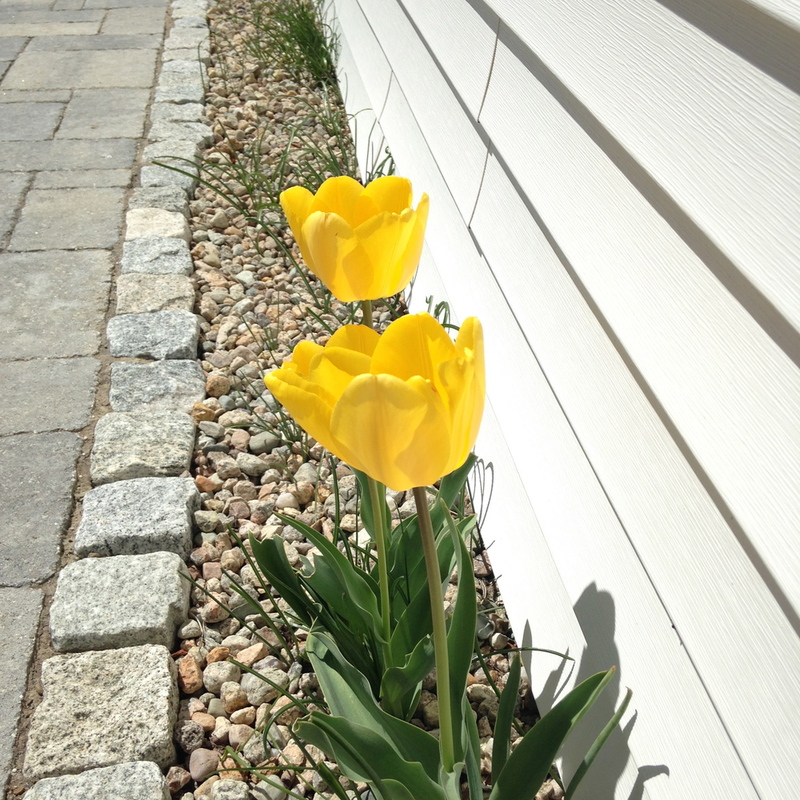 Please feel free to share some of your favorite Spring flowers with us! The great winter of 2015... Glad we don't have to see this again for a while. This post is part one of a series exploring the issue of stormwater and how landscape design can be used to reduce and treat runoff. As I was walking around Somerville the other day I couldn’t help but rejoice at how little snow was left on the ground and how free and clear the sidewalks and roads had become. A few weeks prior you could barely go anywhere. Scuttling along tiny ice-covered paths, haphazardly shoveled through immense snow piles was the only way to get around. Driving was terrible. Parking—you're better off staying put. The MBTA, let’s not even go there. We were all stuck, housebound with cabin fever. Thank goodness that is over. Although now we all take delight in the melting snow and our restored freedom to get out and about, we are left with the unsightly remnants of the past couple months. Trash, salt, sand, oil and gas sheens, and pet waste are everywhere. As the snow continues to melt and the spring rains move in, all of that pollution is going to go somewhere. Street sweepers and sewer systems will capture some of the contaminants, but a large percentage will flow into our streams, ponds, and coastal waters. The water from rain and snow that runs off of the land surface is known as “stormwater” and it is a major contributor to urban flooding and water pollution. Stormwater in Somerville entering a storm drain. Notice the visible oil sheen on the surface. In natural landscapes water is absorbed into the ground through a process known as infiltration. The problem is that in urban environments the land surface is dominated by impervious surfaces, like roofs, roadways, parking lots, and sidewalks. These surfaces create a landscape that does not allow water to be absorbed, thereby creating high volumes of runoff. As the stormwater rolls along it picks up contaminants from road surfaces and other hardscapes. Oils and grease, brake dust, pet waste, gasoline, sediment, and all other sorts of nasty things go along for the ride, ultimately ending up in surface waters causing pollution and environmental degradation. Stormwater can also cause flooding during periods of heavy precipitation when water flows to low lying areas faster than it is able to drain away. Stormwater is one of the biggest contributors to water pollution in urban areas and is a major issue for all highly developed/urbanized landscapes. As we say "good riddance" to all the snow, remember that the water and the contaminants it carries eventually has to go somewhere. In future posts I'll share some thoughts on how landscape design can be used to reduce stormwater volume and lessen the impact that urban runoff has on the environment. Flooding in Somerville after a summer downpour.